Paul Thiebaud Gallery is pleased to present an exhibition of work by Northern-California artist, Wayne Thiebaud. Wayne Thiebaud: Monotypes runs from December 1, 2018 through March 2, 2019. This marks the first occasion that his monotypes have been exhibited together formally. Over forty works comprise the show. Monotypes are rare amongst Thiebaud’s print work. 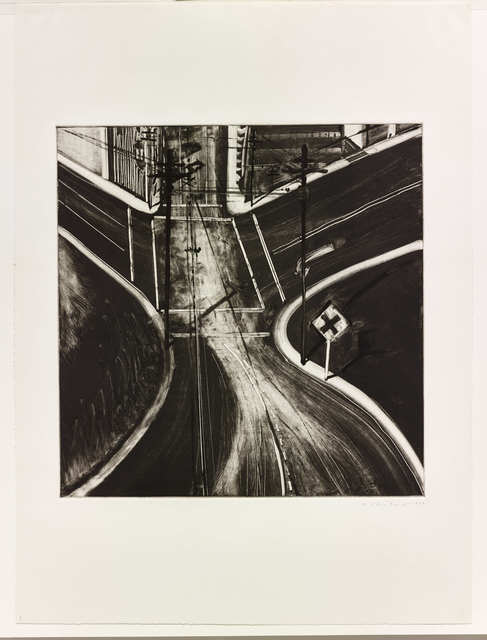 Spanning the breadth of his primary genres— from still life and figures to cityscapes and landscapes—the prints were made in two concentrated efforts, first during 1977 and later in 1991. The 1977 prints, all oil-based, were created at Stanford University at the invitation of Nathan Oliveira [1928–2010], a friend and a professor of art there from 1964 to 1996. Oliveira championed, and to some extent popularized, the medium and its techniques from 1972 until the end of his life. In the summer of 1991, Thiebaud further explored monotypes at Crown Point Press. As an artist- in-residence, he created a large number of prints, experimenting broadly with watercolor-based inks. The majority of the show presents work made during this time. With the end results appearing more akin to a watercolor or gouache painting than to a print, they are quite surprising in effects, “handling,” and colors. In keeping with an innovative approach to a relatively new medium for Thiebaud, the subjects also extend to more atypical subjects—baseball players, circus performers, clouds, figures on a beach, flowers, and cliffs and mesas inspired by the Southwest. The medium’s versatility, freed from the fixed images of etching and lithograph, allowed for much investigation.